Are you looking for a high protein, vegan smoothie that is made without protein powder? The Husband Protein Smoothie is IT! Back in February, when we did the Eat More Plants Challenge, my husband Tim realized he wasn’t getting enough fruits and vegetables into his diet. He ditched his cereal or eggs and toast breakfast for a smoothie that packed with fruits, greens, and, most importantly keeps him FULL until lunch. Tim is a big guy. He’s around 6’4″, 235 pounds. If he’s going to have a smoothie for breakfast, it’s got to be a SMOOTHIE. I’ve been tweaking this recipe for the last few months until I finally got it right. Contains 4 servings of fruit. Contains 2 servings of vegetables. Over 20 grams of plant-based protein. Hulled hemp seeds provide a complete protein, reduce inflammation, have an ideal balance of omega 6 to omega 3 fatty acids, and are rich in vitamins and minerals. Ginger is another anti-inflammatory food and is also great for digestion. Loaded with fiber which is important for digestion. Spinach is a rich source of many vitamins and phytonutrients, making it an anti-cancer food. Naturally sweetened with maple syrup (never mind the bits of almond butter floating in the syrup in the picture up there–I should have used a clean measuring spoon! ), which contains manganese, zinc, calcium, potassium, iron, and magnesium. Contains oats, which have been shown to reduce “bad” cholesterol levels and boost immune system function. The nutritional calculator I use didn’t recognize hemp seeds, so I don’t have a complete nutrition label for you. I did, however, calculate that this smoothie is between 500-600 calories and has between 20-23 grams of protein, depending on how much almond butter you use. There’s not a huge difference in taste between 1-2 tablespoons, but you can taste it more when you use two. I’m so happy that Tim is starting his day in such a nutritional way these days. 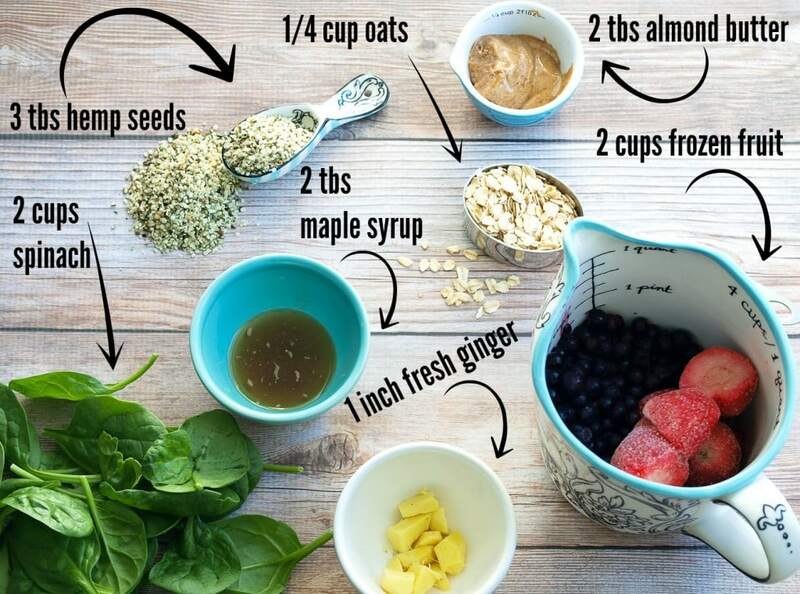 If you or someone you know needs a breakfast makeover, give this high protein vegan smoothie a try! This is a high protein and vegan smoothie that is made without any protein powders. 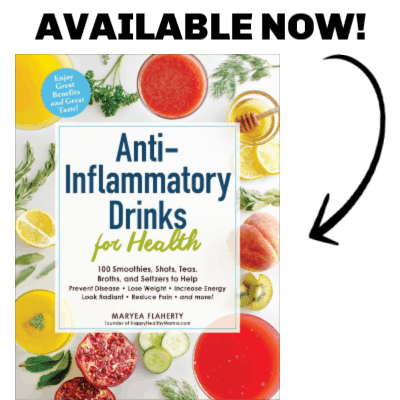 It’s filled with nutrients and is great for digestion. At 600-700 calories and 20-23 grams of protein, this is a smoothie that will fill up even the biggest guys until lunch time! 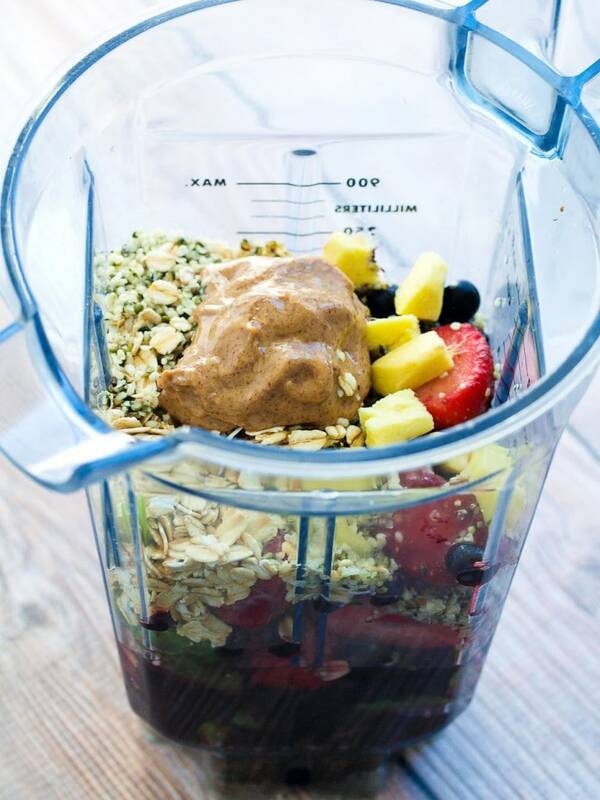 Place all ingredients into the blender and blend until super smooth. This recipe sounds great. Those hemp seeds sound like a good addition to my pantry, I need to give them a try! thank you for this smoothie, but i find it to hard to blend it, can i use little water. Yes, if it is hard to blend just add more water. Hi, can you use any kind of maple syrup? Looks and sounds like a great recipe. We already make similar smoothies but may try your exact recipe too. I like how you explained all the benefits of the ingredients. Thank you!!! What could i put for the ginger? I dont have any stores around here that sell it ?. If you have ground ginger you could use that. Or just leave it out all together. It still tastes great without it. Supermarkets sell minced ginger in jars too. Or minced garlic in a jar from the supermarkets. Oh, this sound delicious and nutritious! Have you thought about adding 1-2 tablespoons of chia seeds for additional protein power (and healthy fats) :)? I like to give my family smoothies to eat with a spoon, so I can add a few small walnuts (even more healthy fats and protein) on top. Hey there, could you please share what camera/lens you use to take such beautiful photos? The body is an Olympus E-520 and the lens is the 50 mm macro ED. I bought the body of the camera before I was blogging when my daughter was a baby and I couldn’t get a good picture of her because she wouldn’t sit still. I upgraded the lens in 2014. I’m dreaming of a new camera, though. I have my eye on a Canon 5D Mark III. A huge upgrade from what I have now, but maybe someday. I was wondering do you recommend a different fruit for the strawberries. I love them but my daughter allergic to them so I don’t keep them in the house. You could do all blueberries! What would you recommend instead of almond butter? I have severe allergies. I would recommend sunflower seed butter or peanut butter. Do you have a substitute for nut butters? We have allergies in our house. You can use sunflower seed butter or leave it out. Have you figured out how much it costs to make each one on average? Budget is a big issue for my family. Thanks! No, I’m sorry, but I haven’t figured that out. We love this smoothie in our house. We hope you dont mind but we would love to share it on our website for the new Nutri Fill-It pouches (launching in August). Full credit and links back to your blog of course. You are welcome to share it as long as you don’t include the whole recipe on your site. 🙂 I’m glad you enjoy it! Looks great! Have you ever made this the night before so it’s grap and go in the morning? Does it still work that way? Thanks! I have put all the ingredients in the blender and kept it in the fridge and then blended it in the morning, but I haven’t tried blending it the night before. Why dont you like protein powders? Also, isnt that a lot of calories just for breakfast? I don’t like the highly processed nature of protein powders. Most of them have more ingredients than I would like to add to my smoothies. This smoothie was created for my husband, who is 6′ 3″ and 235 pounds, so for him it’s the perfect amount of calories for breakfast. I say in the post it would be too much for me. My husband is not quite that tall, & probably half the weight… & would LOVE that many calories each morning. I call his stomach the black hole, & before we had a baby in the house again, I would make him smoothies. I use to add everything but the sink! Love that you have figured out the protein, that’s what I know he needs & is missing. & the protein powders are always just too sweet for him. He comes from Nicaragua & isn’t (wasn’t) use to everything being overly processed. This is right up his alley! Thank you, & if he’s still hungry I’ll tell him to grab those free range hard boiled eggs for on the go too! I also love the prep the night before tip! Perfect! I made this earlier today (though I had to make some substitutions based on what I had on hand) and shared it with my dad (he’s my smoothie buddy), and we both thought it was very tasty. I will most definitely make this again (especially as I often forget to eat on weekends)! Thanks for letting me know, Anon! Tried this with powdered peanut butter (PB2) and a few squirts of liquid Stevia instead of the maple syrup. Super tasty and about 200 fewer calories, 10 grams less fat, and cuts out most of the added sugar – which works for me! Good job on choosing the hemp hearts > chia/flax. Way more protein. What can I sub for rolled oats? Could you substitute Chia seeds for hemp seeds? I found this post through Pinterest and am terribly surprised by how sexist the name of the smoothie is. In my opinion a nowadays wife shouldn’t be considered the only responsable for her husband’s level of hungriness. When I found this it made me a little sad to see how some women still have this mentality. This smoothie recipe was developed for my husband, thus the name. I’m not sure why you think that is sexist. I feel in no way responsible for my husband’s level of hungriness. I do find joy in creating something for him that can fill him up for breakfast. That’s what marriage is all about, my friend. Finding joy in creating happiness or comfort for another person. Nothing sexist about it. Perfect response Maryea – Cristina tried to make a smoothie “political” – unbelievable. But she did get a bonus with her smoothie recipe….good advise about marriage. Something we all need to be reminded of. Great smoothie, I substituted flax seeds for the hemp and honey (from my parents hives) instead of maple syrup. I am drinking this right now! I used almonds instead of almond butter, and blended it with 18 oz coconut water for extra nutrients. This is a great smoothie I will be making again. Thanks for sharing! Oh my gosssh with the ads. I gets that’s how you make money blogging and all that but I just wanted the recipe and I literally can’t even look at it because every time I get close to even the PICTURE of what you used, I get taken to different sites for games and other junk. I’m sorry you had a poor experience with my ads. My intention is to make them the least intrusive as I can. Every ad has an X that you can click in the top corner to get rid of it. I’m sorry if it took you to another place–that only happens if you click directly on the ad, which indicates you are interested in seeing more about it. Assuming If I cut the recipe in half, that means the protein is halved ? I like the name! I’ve been looking for something like this for my husband and my vegan daughter who swims competitively! Thanks! I just made this smoothie for the first time. It is delicious! I cut the ingredients in half and it was the perfect amount for me. It blended perfectly in the Ninja Pro. The fresh ginger gave it a nice clean and refreshing taste. Next time, I am going to try and leave out the syrup as I believe it will still be sweet enough from the fruit. Thanks for sharing this amazing creation! Thanks, Kristy! So glad to hear that! Thanks for your feedback, Ben! My husband can’t eat fruit. How will omitting the fruit affect the nutritional aspects? Also, could I substitute the oats for another nut or seed? Thank you! I made this smoothie and the ginger taste was very strong. I’m going to try it again without the ginger and I think it will taste much better! Thanks for the recipe! Fresh ginger is strong and can be especially strong if you aren’t used to it. I admittedly love a lot of ginger in my smoothies! Are the youngsters in your family hooked to artificial protein shakes after a workout? Now, surprise them with these healthier homemade versions. Your protein smoothie recipe is fantastic. I would love to feature it in our website Green Thickies. Of course all credits will be given to you and linked back to this page. I will not post the actual recipe, but only a small snippet from this page and one photo from here.